I had a clear vision for my online business RememberMeGiftBoutique.com. I had a strong desire to bring awareness to Suicide and Bullying Prevention, while providing Sympathy Gifts for those grieving. During the past year, I have had the privilege of touching many people’s hearts who are dealing with tragic circumstances in their lives. I am in constant appreciation for the relationships that I have established during this business venture. There is an incredible common denominator in all aspects of my business. It is quite simple… everyone is in need of hope! The response to this “free gift of hope” has been overwhelming. 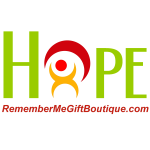 With such a need and desire, I am excited to add this mission of “hope” to RememberMeGiftBoutique.com. It is my plan to focus on inspirational stories, inspirational quotes, and hope in dealing with grief. I will continue to provide the inspirational pictures that seem to truly touch so many of my customers and friends. I would love the privilege of sharing YOUR inspirational stories with others. I have learned that we all go through things in our lives for a reason. Perhaps, it’s simply to inspire others. If you have an inspirational story to share, please contact me at contactus@remembermegiftboutique.com. There is something to be said about the way we feel when we turn the corner of a New Year. All of those resolutions, hopes and dreams, and anticipated adventures fill us with a renewed spirit. Personally, I have a “to do” list that will serve as a reminder of what I want to accomplish throughout 2012. RememberMeGiftBoutique.com’s strongest desire is to continue to bring hope to those either grieving or in need of a little inspiration to get them through the tough times. While our personal goals and dreams for the New Year might consist of eating better and exercising, there are those who simply would like to find just a bit of hope. In our “give back” mission, we’d like to continue to bring awareness to the causes of Suicide and Bullying and wrap our arms around those experiencing the emotions of either cause. I encourage other business owners to find a simple way to “give back”. A friend of mine has a business, www.dressygirlkouture.com, where she will “give back” by donating prom dresses to those less fortunate. Another inspirational story concerns a friend who owns www.socutepooch.com. She actually purchased her business after personal struggles and wanted to “give back” to children fighting cancer. How do you plan on giving back this year? Please share your stories which will hopefully inspire others to do the same. I wish you a year full of hope and happiness. I remember very clearly the day I decided to start my own business. I was sitting at my desk when I received a phone call that a friend’s daughter had committed suicide. Ever since my brother’s suicide (which I briefly discuss in my “About Us” section of my website http://www.rememberme-gifts.com/pages/AboutUs.htm), I’ve had an unresolved feeling that I needed to do something to help hurting children, adolescents and adults who are contemplating taking their own lives. I also had a strong desire to find a way to bring comfort to their families that were left behind due to such a choice. Since my little brother’s death, I have heard too many stories, too close to home. I decided that it was time to pursue my passion of awareness and prevention full-time! However, I am a single mother of three who needed to make a living. So, I merged together my desire to help the grieving by selling unique, personalized, and meaningful sympathy gifts, www.RememberMe-Gifts.com, with my longing to bring hope, inspiration and awareness to those suffering through www.RememberMe-Awareness.com. I was extremely excited about this venture and actually informed yet another grieving mom (who lost her daughter to suicide) about my decision. Her reaction… well, it devasted me. She was concerned that I would be profitting from her daughter’s death. Obviously, she didn’t know me well, and she was in hopeless state of grief. I certainly understood her position, but somehow thought it would bring a bit of comfort to her knowing that something was being done in her honor. I do realize, however, that there are many companies that promote charities in an effort to promote themselves. To that I say, “shame on you”, and I never want to be seen in the same light! But I think of this constantly. Those who know me, know my heart. Hopefully, through this blogging adventure, people will get to know me and understand my true passion for this venture. Please feel free to share your comments or questions.